Seek some comfort with Henry and Spike at Watermark. They look super adorable together. Kitikata-san reveals the ultimate fantasty - red hot chicks which will drive any kitty wild! 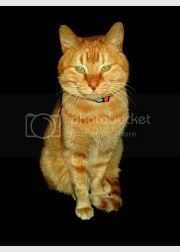 Such sad news which I only found out today - Scoop from Katz Tales passed away. 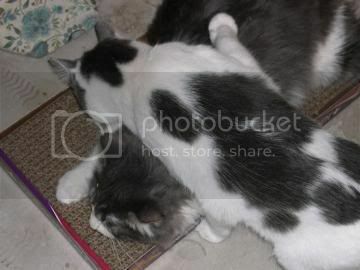 I've grown to love the stories about his antics with his kitty pal Au that is published in our local paper. Do drop by and say words of comfort to his owner, Ellen. 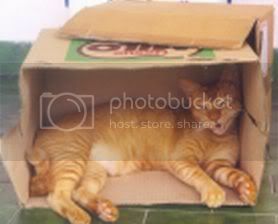 I'm sure Scoop is meowing loudly, snuggling in cardboard boxes and chasing birds up in Kitty Heaven. Join Samantha and Tigger from Life From A Cat's Perspective as they have a lazy Friday afternoon staking their claim on their possessions. 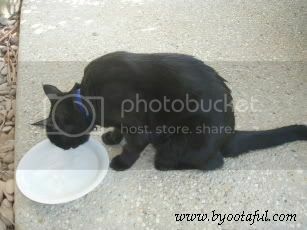 The poor stray kitty at Very SEDAP!!! looks for food. 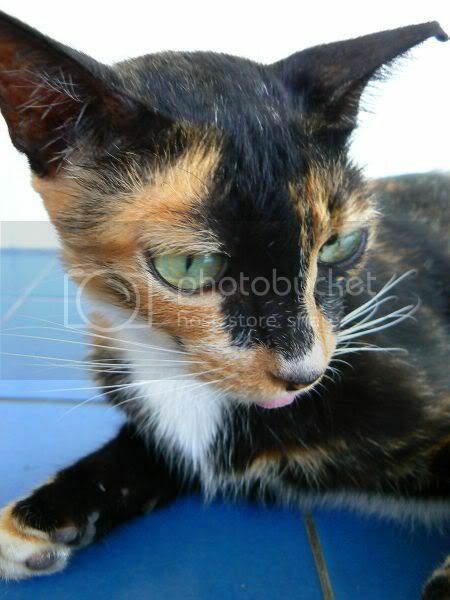 She looks like a sweet calico stray cat I feed. Kitchenmage shares with us the mighty Missouri Bow-Tie pictures on top of his "Dell" throne. 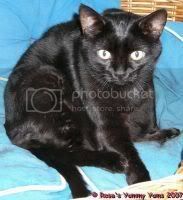 He's Farmgirl's virtual cat which Kitchenmage has threatened to eat numerous times. I think he's adorable even though he does not look amused in the picture. 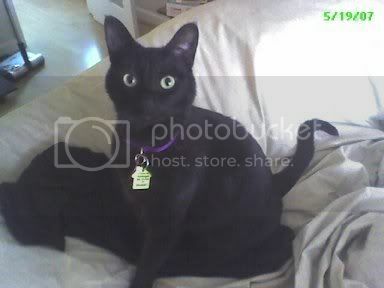 Boni Maroni from House of the (Mostly) Black Cats wonders why camera phones have invaded her peace. There's adorable kittens - two batches at The World According to Pia who're learning to get along but driving Pia up the wall by not following house rules. Such adorable balls of fluff. 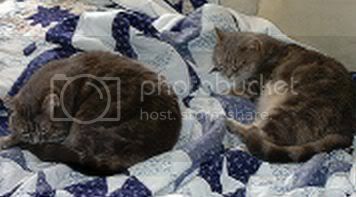 Kashim and Othello have a lazy Caturday snuggling up on Astrid's bed over at The Catboys Realm. Maruschka who looks as sleek as ever from Rosa's Yummy Yums is enjoying the colder weather. 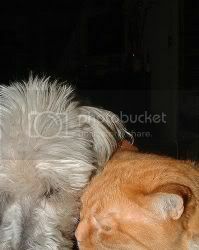 G'day to Katie and Puddy from A Bytootaful Life. Poor Puddy is suffering from the heat but she's found a lovely patch of dirt to keep cool and has a lovely Mummy who's giving her ice cubes in her water. iMeowza relates to us about the catnip fight with Bazel - lots of nice talking and wrestling techniques involved. 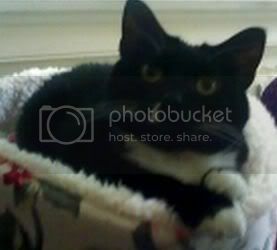 Luna from catsynth.com is enjoying the laundry while Amar is away in New York. Gir from Life in the Country joins us for the first time so G'day to Snosked and Gir. See how dainty Gir's paws are hence the nickname "Dainty Foots". 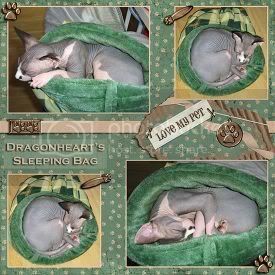 Visit Dragonheart's Domain where Dragonheart is feeling under the weather. Get well soon, Dragonheart. Weekend Cat Blogging (WCB) 121 - We're Hosting this Weekend, Come Join the Fun! It's the weekend and the felines of the world rule!!! We're hosting WCB this weekend so do drop us your link to the kitties at boo_liciouskl@yahoo.com or at the two comment boxes - left for Haloscan for non- Blogger registered and right for Blogger registered. 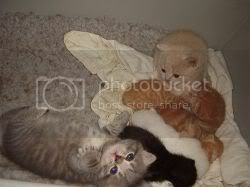 I'll be updating the round-up constantly so keep checking up on the kitties. This weekend, the kitties in the house heard there was going to be WCB and they all decided to do a dissapearing act on me. 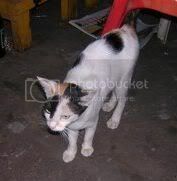 It must have been the camera but only the stray calico cat was around demanding for her food. It was difficult to get a good pix of her as all she could do was move restlessly (this was before she had her dinner so she was mighty anxious I finish and feed her) hence this is the best I can do. She's doing well - getting her 2 square meals a day. She still has not let me see her babies at all. I guess in good time she will but at the moment she is happy with where she is nesting hence I don't intend to disturb her. I realised I've been abandoning Indian food for a while with all the postings on Ramadan Bazaar. Not fantastic pictures this time round as I find I have so much trouble making it look nice when the food is all scattered all over the leaf. This place kinda appeals to me - not for their weird seating (see the review below for pictures) where they arrange their tables just like a seminar but more for their home cooked taste and the promise of no MSG in their food. Must haves here I reckon is the fish items - they had teeny weeny Ikan Bulus that day when I dined here. Fantastic stuff as the smaller the fish is, you can crunch all the fine bones up when it's crispy. 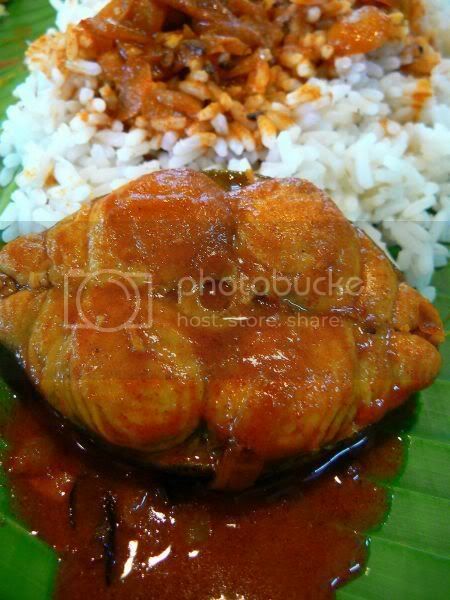 Ikan Bulus may look weird but it has a sweet fine flesh within. Another favourite is their Curry Fish Cutlets - tender fish cutlets in a slightly tangy curry sauce. 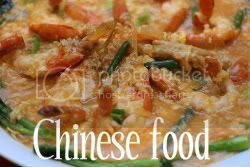 Great with lots of rice and vegetables. What's not great is their Deep Fried Mutton Chops - tough meat which will put your jaw through a work out that will exhaust it. Although this place is well hidden from the main road, it draws quite a few customers during lunchtime as it's near the temple. It's also open during breakfast time hence you can get the usual rotis, thosais and etc. No Ramadan Bazaar post for today - sorry! I reckon I'm approaching the end when it comes to these bazaars since I've covered almost all of them which is relatively easy for me to access. There are some new ones which I do want to explore like Datuk Keramat, Taman Melawati, Jalan Tuanku Abdul Rahman and etc but those will be for the weekends only when we have the time. In the meantime, for a change here's some Japanese food. The El Presidente of the Japanese Food Kawan Association may be away for some R&R (rest and relax) but the quest for Japanese food continues. Here's a place which I tend to end up for dinner. It's not too fancy a place but serves pretty decent Japanese food. Having tried quite a few items on the menu, I reckon they do two things best - Wagyu Beef Don and Kaki Mayo Yaki. This place used to be at Desa Sri Hartamas but relocated to the shopping centre which is more accessible. Aside from the regular menu, they also do board specials so do check with them what's good. Run by a Japanese fella who you will see behind the sushi counter, this place attracts locals and the Japanese expatriates. I reckon they also get quite a lot of spill over customers from Rakuzen which is forever packed with people. Let's start with lunch - they do a Combo Set Lunch whereby you pick and choose items from a menu with choices for sashimi, teppanyaki, tempura and pan fried items. 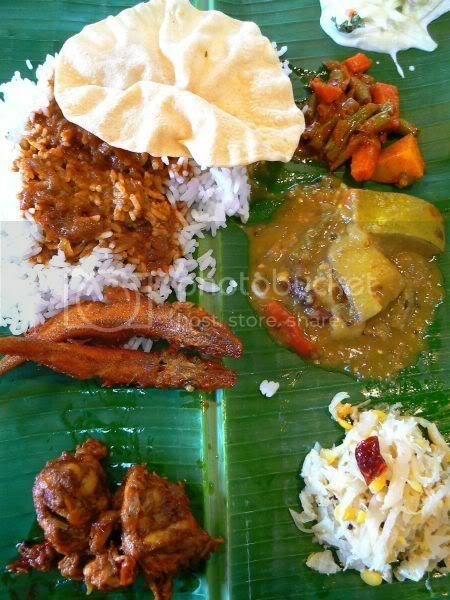 Prices range from RM18++ to RM33++ depending on how many items you picked. Although you get a nice variety bear in mind this is a set lunch so portions can be tiny. 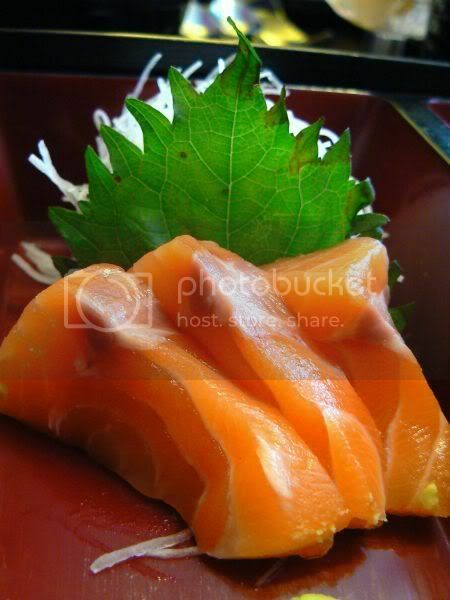 For instance, the salmon sashimi item will be 3 pieces and if I remember correctly the deep fried scallop, they'll only give you one for the set. All the sets come with rice, miso soup, chawan mushi and fruits. Their dinner sets are also pretty decent. 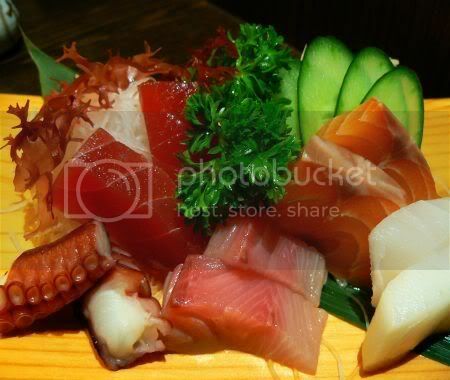 I usually try their Sashimi Set which is served with a selection of raw fish. Can't remember how much it is but it should be in the RM20 to RM30 range. They serve a selection of makis which are farly decent. 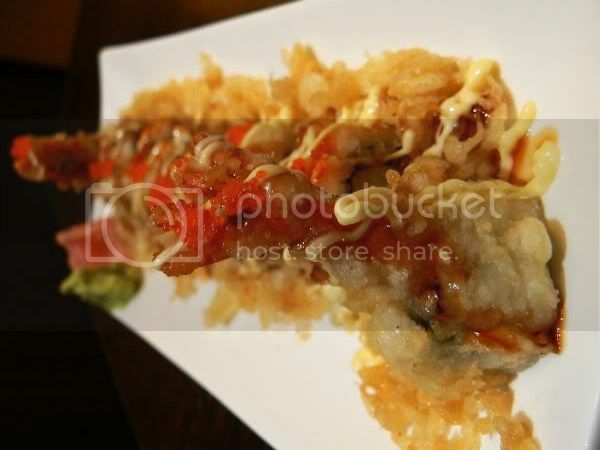 The Tempura Roll is kinda like the Groovy Sushi items as the maki is coated in a tempura batter and deep fried. The Dragon Roll which we tried has avocado, prawn tempura and unagi which was not bad. 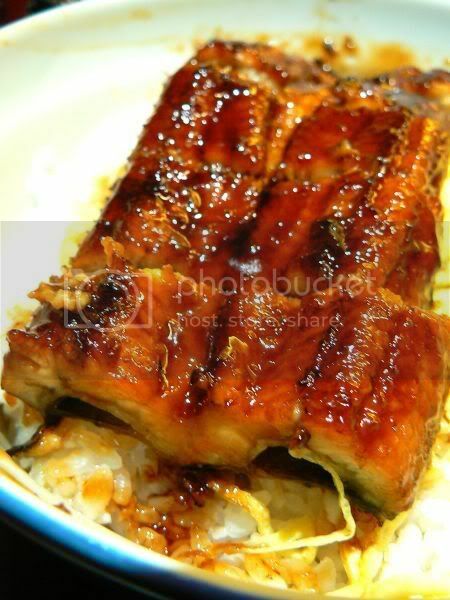 Since we tend to frequent this place for dinner, it's always a simple rice or "don" items. I've tried the Unagi Don (it's abt RM26 if I am not mistaken) which was not bad - shredded omelette and juicy unagi which topped a portion of rice. The Tendon is also pretty decent with a selection of deep fried tempura items. 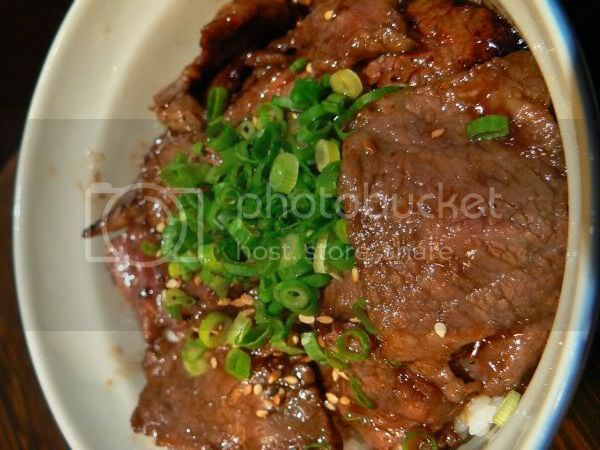 However, the best and our all time favourite is their Wagyu Beef Don - juicy pieces of tender wagyu beef lightly coated with their special sauce topping white rice. It's a must order for us when we dine here. Other items we have also tried - Asparagus Cheese which is asparagus sticks with cheese powder and deep fried. Not much of a cheese flavour and the asparagus they used had woody or hard bits. I've also tried their Lamb Miso Steak - lamb shoulder with a miso sauce served on a hot plate. There's deep fried onion rings on the side. A bit salty and the cut of the lamb was a bit tough. 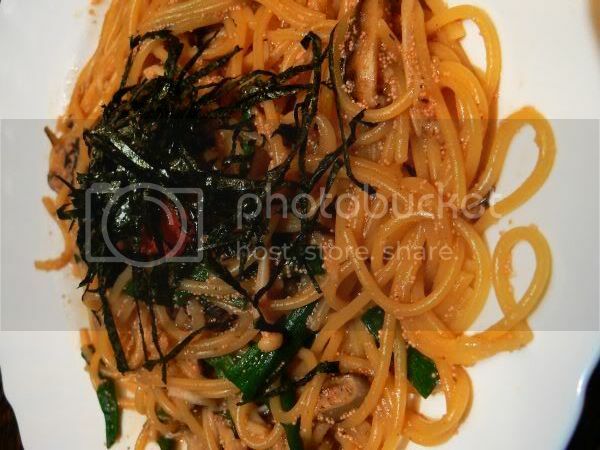 A favourite of mine is the Mentaiko Spaghetti - it's a bit different here and kinda reminds me of the Chinese style of cooking pasta sauce. The salted cod roe coats the spaghetti strands which gives it a slight bite that is nice. 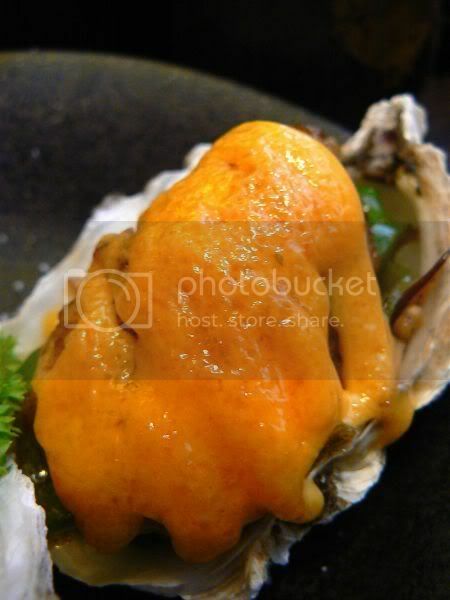 Another must have is the Kaki Mayo Yaki - oysters which are pan fried with sliced mushrooms and green peppers. It's placed back in the shell and topped with mayonnaise which is then grilled. Absolutely delicious!! Do give it a try and remember to order the Wagyu Beef Don (RM28) and Kaki Mayo Yaki (RM15) which never fails to dissapoint us. The restaurant also issues a frequent customer card where you accumulate points based on the bill you spent. Once you hit a certain limit, you're entitled to free food. Takes some time to achieve this as it's a lot of points to accumulate so don't expect free food straight away. The Kampung Baru is well spread out within the village. Most of the activity is focused on Jalan Raja Muda Musa due to it's proximity to all the eateries and the LRT Station. Since we got a parking space near the school behind Jalan Raja Bot, we decided to just explore that area. 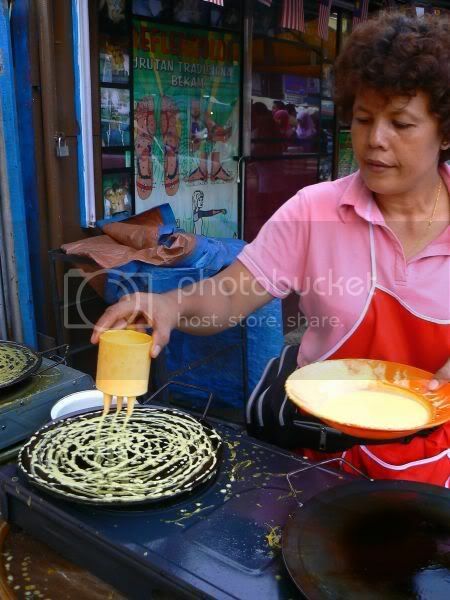 There were quite a number of stalls selling Roti Jala. I even managed to catch the lady preparing it on the spot. 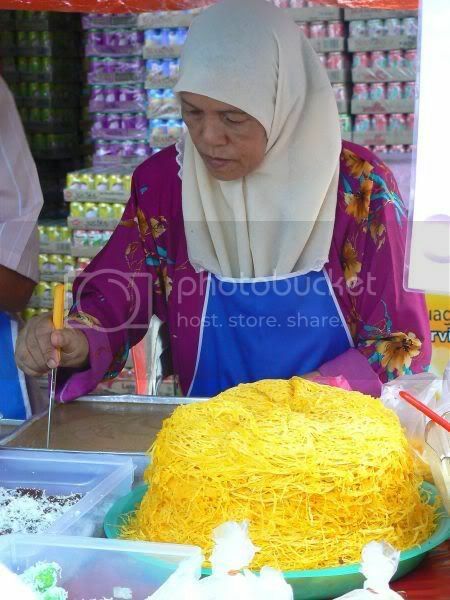 This stall also had roti jala which was pre-made and stacked in a pile of yellow noodle like strands. What's unusual about this stall is they serve pulut (glutinous rice) or roti jala with durian sauce. 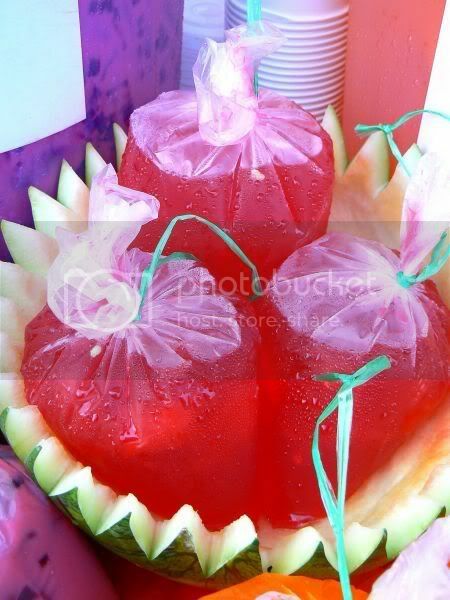 I have yet to search for Air Bandung for Cat Cat but as a consolation, here's watermelon juice which the traders decorated by placing them within these cut out watermelon bowls. 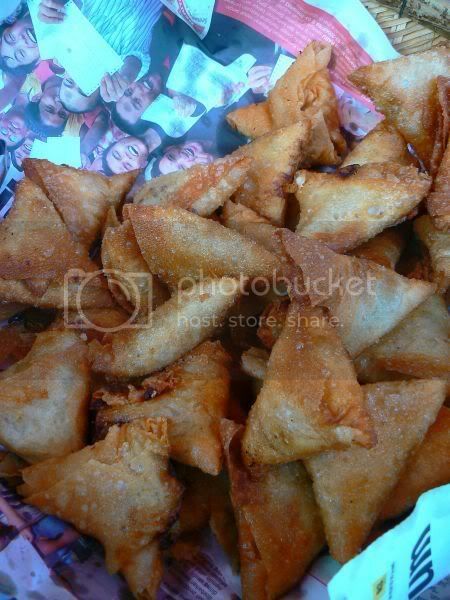 This stall was selling crispy samosas stuffed with meat fillings. You can see them freshly frying the items. 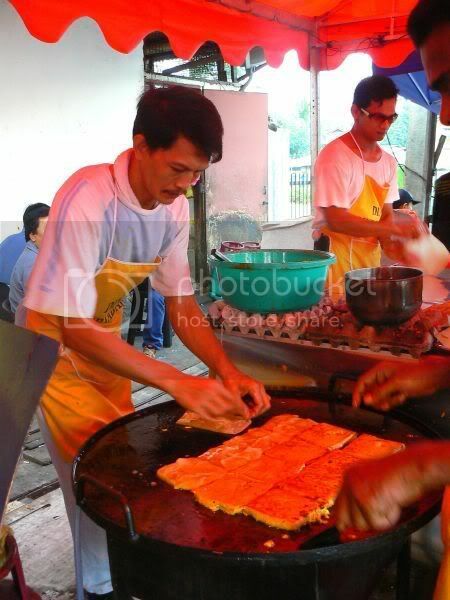 There were 2 Murtabak stalls side by side bearing similar names and doing brisk business. 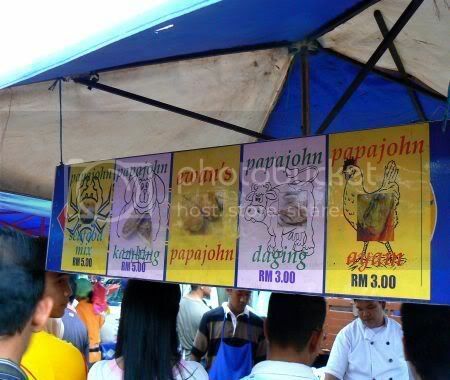 One stall is called Murtabak Din and if I am not mistaken the other one is Murtabak Pak Din. 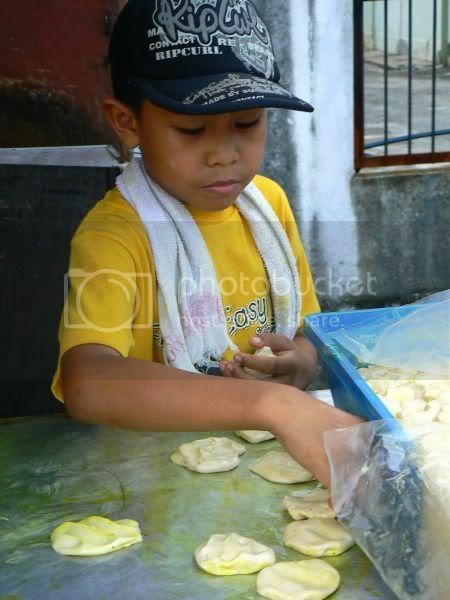 This kid was helping out at the stall by removing the dough balls to be flattened. These guys were trading under a bright red canopy hence the reddish tinge and it was busy busy making sure they filled the orders for murtabak. 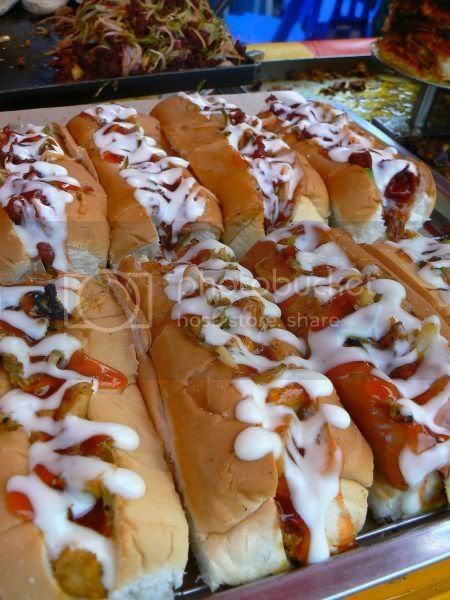 They had loads of kebabs all filled up in soft buns and drizzled with mayonnaise and chili sauce on display. 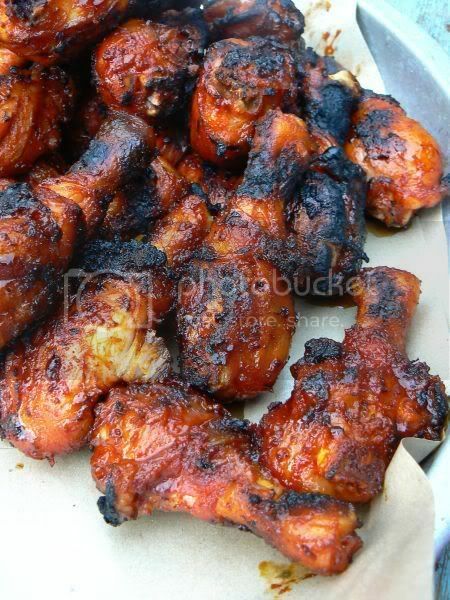 Although the chicken drumsticks looked a bit burnt from the hot fire, I liked their caramelised and golden brown colour. 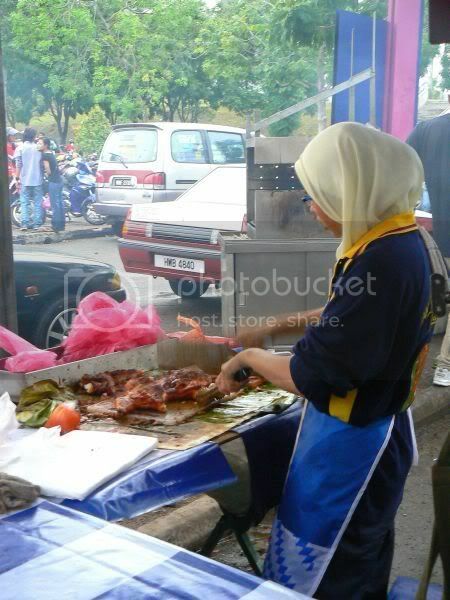 Ayam percik here is pretty reasonably priced as they sell smaller pieces at RM1.80. Bigger pieces are sold around RM5. 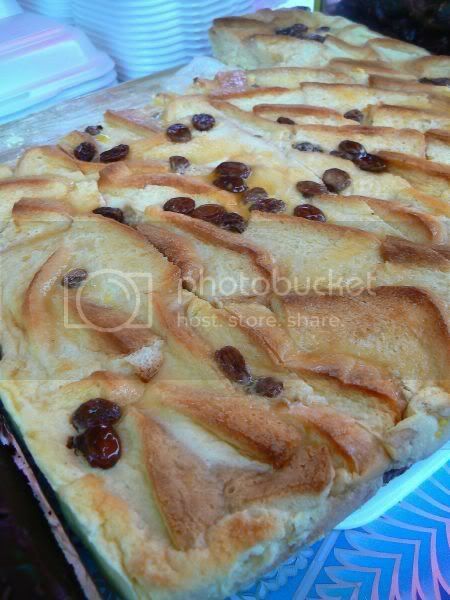 Something unusual in Ramadan Bazaars - bread and butter pudding. 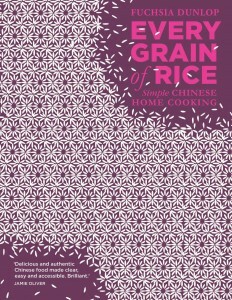 It's quite a simple version with just slices of white bread and raisins. 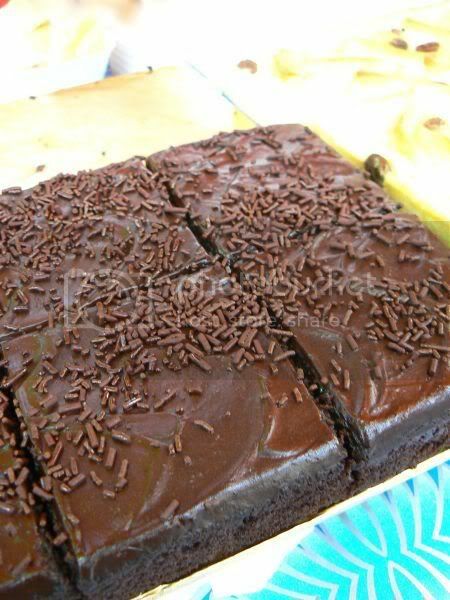 Tasted really good too (a piece is RM2.50) as the pudding was moist. The lady at the stall was also selling chocolate cake which seemed to be selling better than the bread and butter pudding. There's not much sweet items on the street as most of the kuih stalls are on Jalan Raja Muda Musa. If you can, take your time to explore Jalan Raja Muda Musa but beware as parking is quite problematic due to lack of space. Braving the dull skies, we made it to the Shah Alam stadium which was packed with people since it was the weekend. This time round, there were fewer stalls here - previously there were 4 rows of stalls, this year only 3 rows. 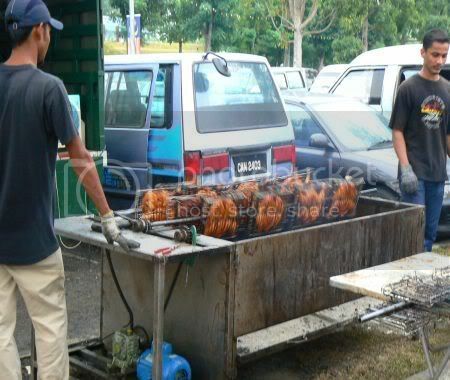 One of the stalls which grabbed my attention was this unique ayam golek stall. 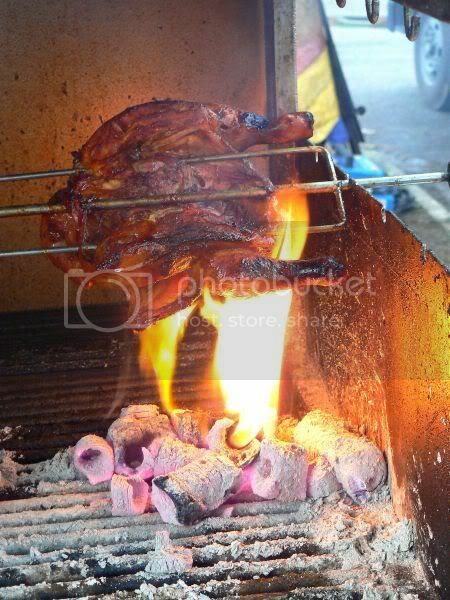 Instead of just turning the spring chicken rotisserie style, this stall had taken it one step further by using spatchcocked chickens i.e. split and butterflied. They had attached an individual netting for each chicken on a large metal rod. These rods are turned automatically and continously by using a motor with a portable generator. 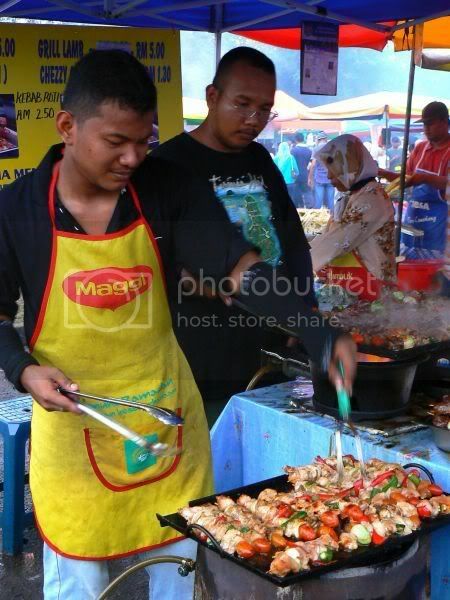 Known simply as Ayam Bakar Madu Asli Zaharah, the stall had loads of people waiting for the batch of chickens. As it had rained earlier on, they were behind schedule with insufficinet charcoal. This particular stall trades from pasar malams in Bandar Baru Bangi and it's their first time in Shah Alam. By butterflying the chicken, it cooked faster and tasted juicy and succulent. A bit pricey at RM17 but really yummy stuff which we had for dinner. This is one thing I love for it's aromas - sotong bakar. Thin slices are grilled to make it crispy. 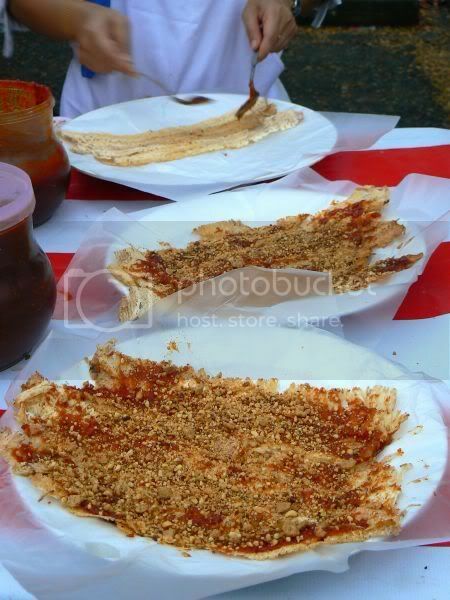 Once ready, the sotong pieces are slathered with chili sauce and sprinkled with lots of crushed peanuts. 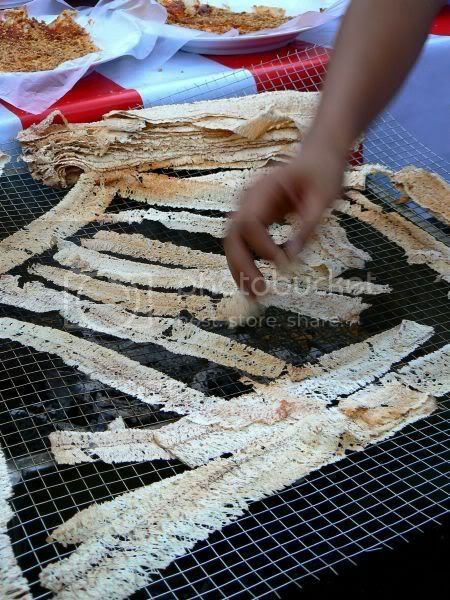 This was pretty unusual - roti goreng. 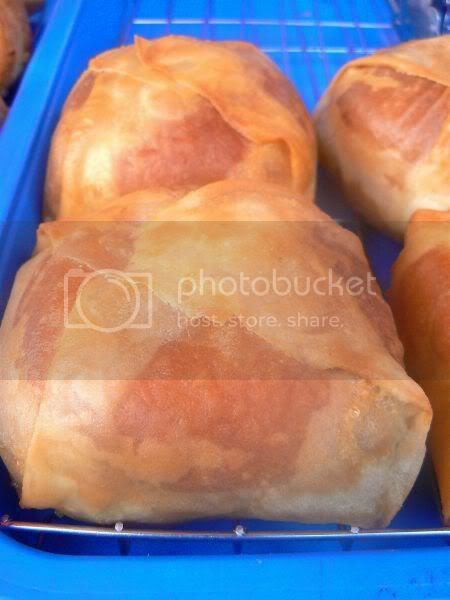 It's actually a bun filled with beef cooked in chili sauce that has an outer layer like popiah which is deep fried. 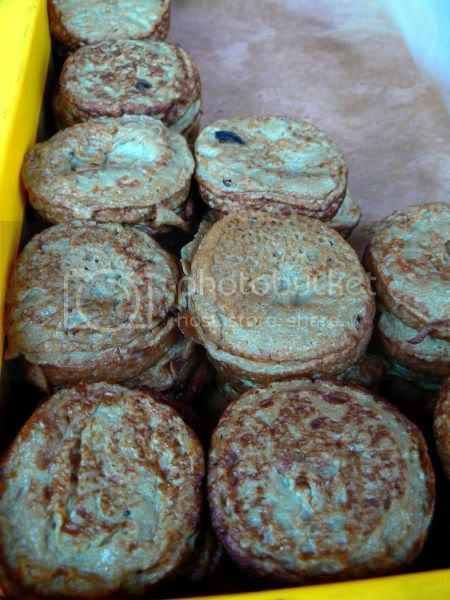 Tastewise, not bad as the bun within is tender with the crispy outer layer. My favourite - nasi kerabu tinged blue. 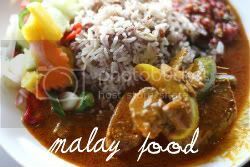 You can add whatever you like whether it's daging salai or solok lada - stuffed green chilies with fish paste. 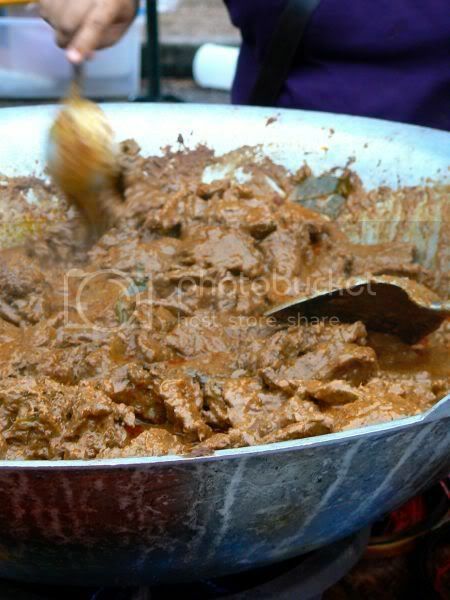 I always love these big woks filled with rendang to the brim. They look good and are used to keep the rendang warm. 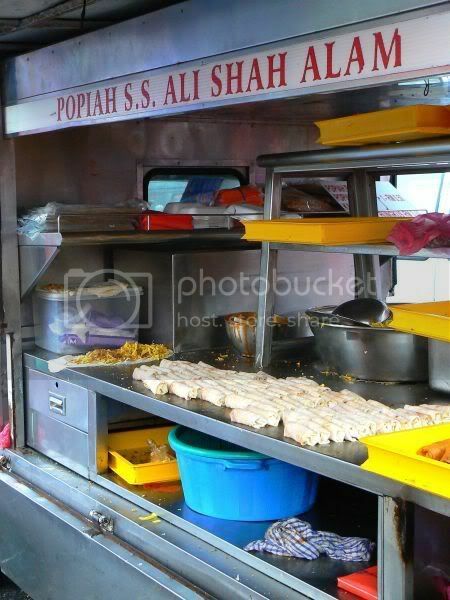 This is for one of my readers, Dhill who left a message earlier on asking about where to get Popiah S.S. Ali. They have a van here selling their ever famous popiah basah. Long queues as ever waiting for it. This year they seem to have downsized as last year they had two vans here. I suspect they may have placed the other van at another Ramadan Bazaar. Something unusual - Pecal Tanjung Karang for RM2. 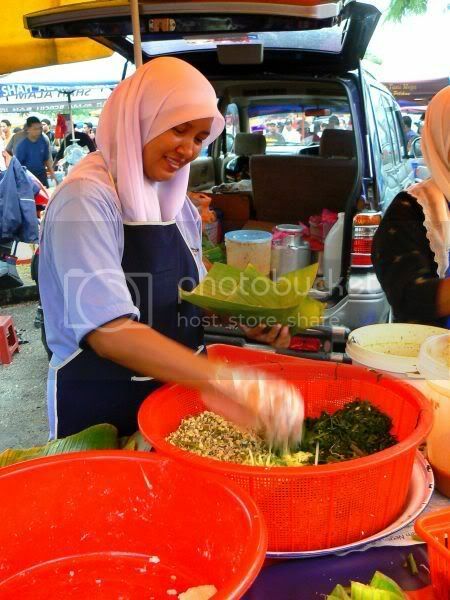 This lady was seen continously wrapping the pecal in banana leaf parcels for people to take back. 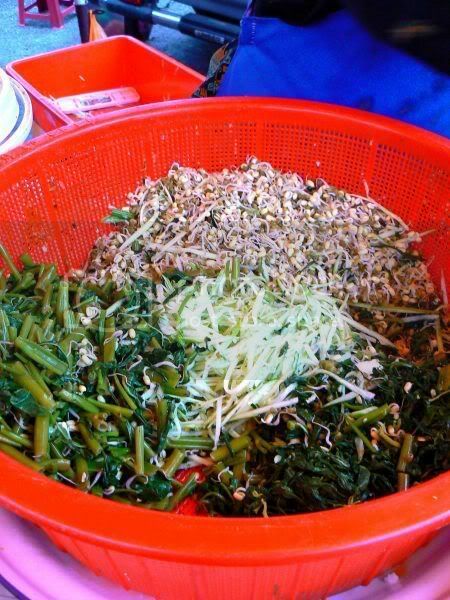 This version which is from Kuala Selangor has various types of vegetables and nasi impit or compressed rice cubes served with a peanut sauce. 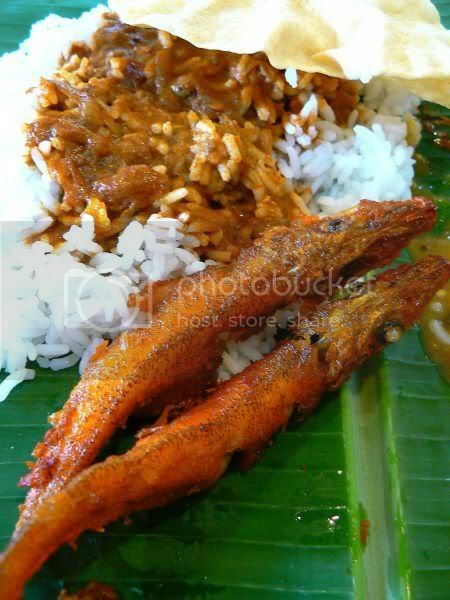 Usually the versions from Indonesia is served without any rice. 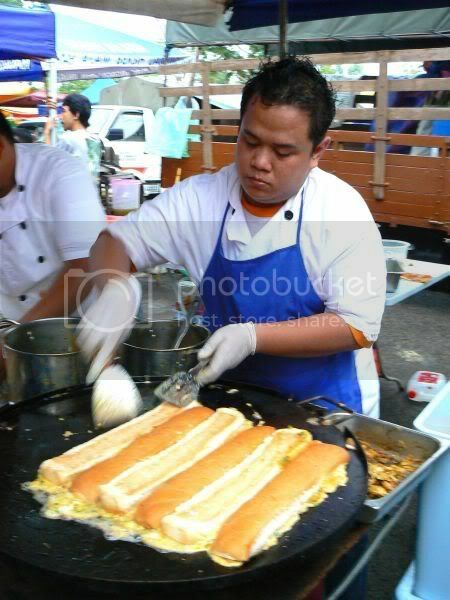 This particular Roti John stall came highly recommended hence we stopped by to try it. Thumbs up as it was the best Roti John we tasted so far with a minced beef and egg topping the soft bread rolls. 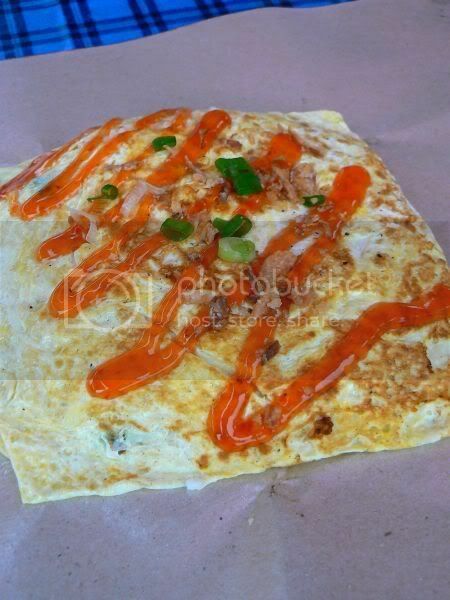 Spied two stalls selling Nasi Pattaya which is fried rice wrapped in an omelette like a parcel. One even sold it with a piece of fried chicken that looked very tantalising. 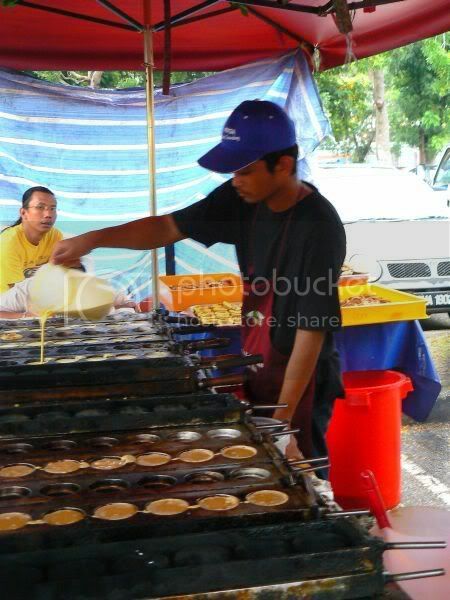 This stall was selling their version of Kuih Akok, the Kelantanese delicacy made with lots of eggs and is quite sweet. It's unlike the usual shape as their version is thicker and rounder. 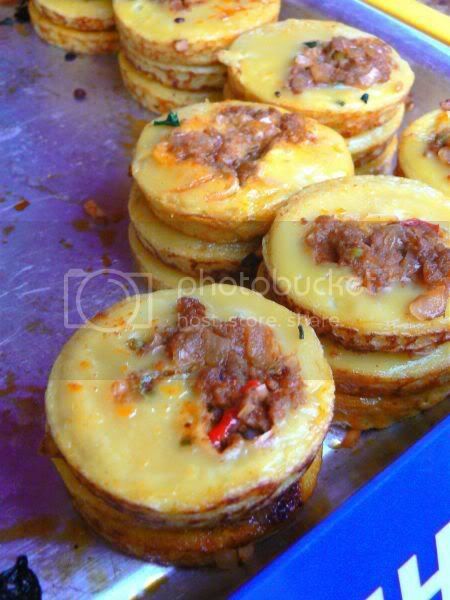 They were also using the same moulds to make Kuih Cara Berlauk whereby minced beef and chopped chilies is added to the batter. I remember this particular kebab stall from last year. They're doing booming business this year but you will need to wait it out as they cook in batches. 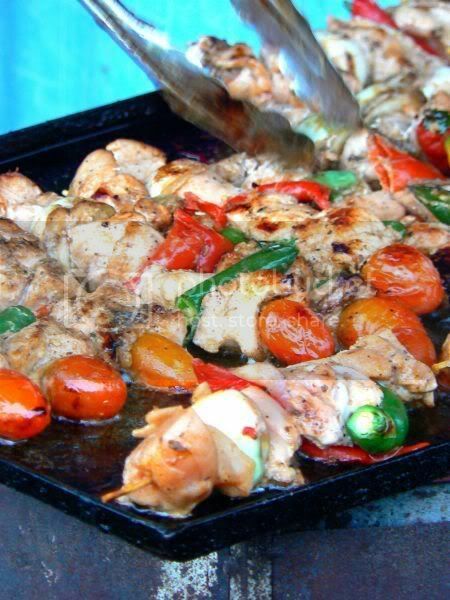 The chicken kebabs looked really good with tomatoes and bell peppers stuffed between chunks of chicken. 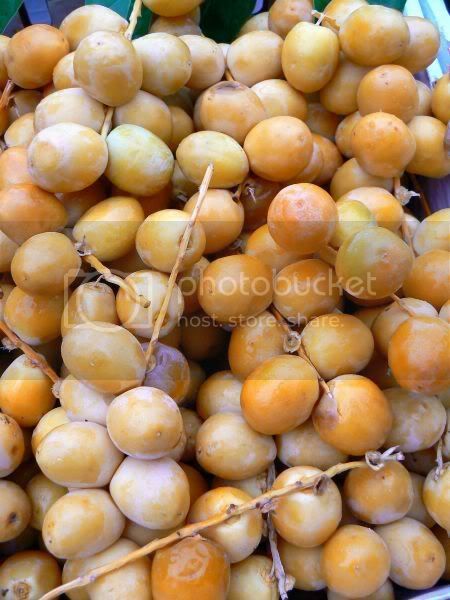 I didn't manage to any pictures of sweet items except for these fresh dates as most of the items were gone by the time we arrived. Unlike last year, there's also not many variety and only one agar agar stall compared to about three stalls. 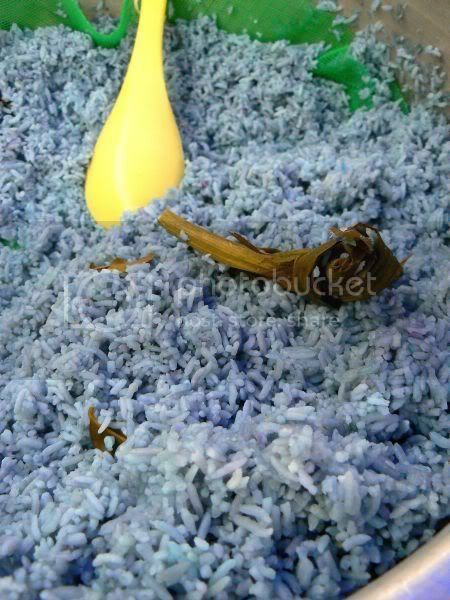 Other stalls like the cendol pulut and tapai stall is still around. There's also a lot of stalls this year selling hot soy bean milk. See the 2006 and 2005 posts on the bazaar for further details of the other stalls.